It’s taken me a while to pick up this book. I’ve been busy. I’ve been in important meetings helping people make important decisions. I’ve been in demand. And it’s worn me out. I’ve neglected my relationship with God. 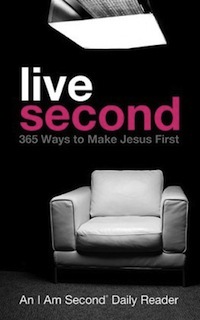 So I’ve been thumbing through live second: 365 Ways to Make Jesus First, a book I received months ago, but was too busy to pick up. It’s a journey. This book is not unlike a lot of other devotionals out there, it’s goal is to help us grow daily in our relationship with God. It does occasionally point you to a video on their website. It encourages you to work with others in helping you in your relationships. It tries to help you see it’s best to put Jesus first in your life. And maybe, if you are in the right place in your life, it will. Book has been provided courtesy of Graf-Martin Communications and Thomas Nelson. I’ve appreciated what you have been able to do in all those meetings, Nick and would suggest the good you have accomplished has to be part of your relationship with God. I do take your point in the review, though. I have found some of these types of books helpful, others not so much. Would you say this one is better or worse than most? I realize that I am not the primary target for this devotional, it doesn’t go “deep” enough for me, but I have been using it as a reminder for myself, and as the opening of a greater devotional time. It’s from an evangelical, conservative viewpoint, which I enjoy, but will not work for all. As with all devotionals, you pick what works best for you.